You want me to provide my own firewall? I guess my main problem with Danny O’Brien’s thinking about running web-based services from home is a kind of category uneasiness. The kind of services Danny wants us to run belong, for me, to the same category as electricity, a working phone line, gas supply. They’re utilities and they need to work all the time. I don’t trust myself to provide a stable power supply, a properly installed mail server, enough redundant hard disk for all my files. Some services just need to be nearer the centre. The extreme fringes (my kitchen, for instance) are not the best place to provide guaranteed or high-availability services. I want someone else to worry about all that. And besides, who would I complain to? Danny O’Brien’s been talking about making good use of an always-on home connection to replace all those web-based services we’ve become dependent on and that are about to start charging. I’m looking forward to seeing his conclusions. So far I’ve got that ‘Apache installed here’ screen up on the Cube in our kitchen but I’d love to be able to fix it so I can see my MP3s from the office (or wherever). Only total UNIX-fear prevents me from sorting it out now. Thinking about it, though, with my kids playing Flash Tweenies games, regular power cuts and reboots and a very flakey Wi-Fi connection do I really want to be relying on a home machine when I could be paying Apple $100 per year for something that really is ‘always-on’. I?m not sure that I can make a meaningful connection between Groucho and Elvis (apart from the fact that they both died 25 years ago this year) but if there is one, I reckon it’s got to do with the epic generosity of the performer ? of the entertainer ? that they share and that always humbles me. Great comedians ? funny people in general ? remind us of our humanity, our incompleteness ? and also of the the possibilities. The best book I’ve read about Groucho and the whole Marx Brothers phenomenon has been Simon Louvish’s Monkey Business (UK, US). An unpretentious read grounded in Louvish’s obvious admiration for the brothers, focused on the documentary record and never afraid to chuck in some of the brilliant original material. Groucho was a complex and worldly figure whose work gets better with time ? perhaps his Century’s most important popular entertainer. He was also the funniest man that ever lived (if you ask me). So, over there, on the right, above the Cage-o-gram, I’m introducing the ‘Groucho-gram’ ? an occasionally-updated Groucho quote and a naked inducement for you to buy Monkey Business. Actually, now that I think about it, the other really good Groucho book I can think of is a beautiful collection of his letters to his daughter Miriam called Love, Groucho (UK, US) that would give any father something to aspire to. So you’ll probably want to buy that too. The Economist?s cover story this week is a blockbuster (you may need to subscribe to see the story). The message is simple: the population of Europe is ? almost everywhere ? falling or about to fall, while the population of America is climbing steadily. There?s a strong likelihood that by 2050 there will be half a billion Americans and fewer Europeans than there are now. The US economy could be twice the size of Europe?s, even after the addition of the new member States to the East. In the meantime, the European population will be aging fast while the US population, bolstered by higher birth-rate immigrants, will be younger and more productive. The economic and geo-political implications are obvious. If European birth rates cannot be raised (and changing reproductive habits from above is notoriously difficult and unpopular) then immigration must be encouraged if a century or more of decline is to be averted. Now would be a good time to start ? while Europe basks in its (surely temporary) popularity amongst refugees and migrants from the East. The flow must be organised and encouraged. Infrastructure must be put in place to train and support incomers. Governments must make honest efforts to challenge public (and media) hysteria about immigration. It has been plain for decades that absolute population decline was likely in Europe but the American statistics suggest a more drastic fall relative to the US, our primary competitor. We have an opportunity right now to avert our own demographic emergency while meeting the needs of millions of needy (and economically productive) people. Fat chance. I tried to date Hilary Rosen?s battle with the demons of high-tech. Perhaps I shouldn?t have been surprised to find this Usenet reference to her 1989 opposition to Digital Audio Tape (DAT) ? perhaps the only real victim in recent years of the rights owners? zeal. DAT was confined to a ?Pro-only? ghetto after a prolonged battle with the music biz saw the imposition of an early DRM system and an artists? levy. DAT is long forgotten but, with hindsight, should the rights owners have learnt from developing product for an early digital platform instead of just killing it? Would those lessons have been helpful in responding to the out-of-control misbehaviour of the new generation of digital consumers? That would be a ?yes?. Is this what they call creative destruction? (This is a longer version of an article written for The Guardian) The music and tech industries have been locked in mortal conflict for decades with no resolution in sight. This time around, will the all-powerful rights owners snuff out innovation and consumer choice or will the maverick geeks and their friends in the tech industry impoverish the artists and record labels? Neither. Nike ads and remixes notwithstanding, the passage of time has not been kind to Elvis. Outside of the faithful, he?s still mostly considered a mockery. The problem is that he was never really a rock star. At least not in the post-1960s sense. A crop of early sixties acts (mostly British) changed our definition of the popular musician forever. Before the Stones (and the Beatles and The Who and The Kinks?) a musician was an entertainer, an uncomplicated mouthpiece for song writer, management and record label. Talent. After the Stones, a rock star was a different kind of creature all together: autonomous, self-directed, ironic, important. Elvis was a working class kid who grew up in the era of the entertainer. He never shook off the limitations of the role and never aspired to exceed them. He never wrote a song, delivered a manifesto, challenged a convention. He never took up the new entitlement of the musical God to scare or affront or challenge. His excesses were all inward-focused, self-destructive, sad (there may have been 14 TV sets in his house but he never tossed one out the window). None of this compromises his brilliance as an artist. His funny, honest, human performance in the 1970 Las Vegas concert performance ?That?s the Way It Is? (DVD UK, DVD US, CD UK, CD US) is wonderful. He?s a magnetic, complicated, supremely engaging figure. So it’s here. Possibly the most hyped consumer tech product in recent history (apart from Ginger) has finally arrived and it is mindblowing. Shazam has morphed from not-here-yet near myth to jaw dropping ‘how do they do that?’ actuality over night and I am in awe. So far, it’s correctly guessed Little Johnny Taylor’s ‘Starting All Over Again’, Iggy’s ‘No Fun’, White Stripes’ ‘Pretty Good Looking’, The Meters’ ‘Jambalaya’, Bob Dylan’s ‘Sara’ and Johnny Cash’s ‘Mary of the Wild Moor’ and failed only with ‘Sad Skinhead’ by Faust. Krautrock coverage not up to scratch yet, evidently. I get the feeling I could go bankrupt trying to catch it out again, though. Stunning. For people of my generation (I’ll be 40 next birthday) Bamber Gascoigne is a creature of myth. 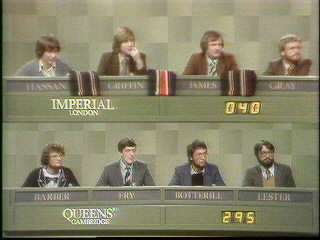 He was the cocksure big brain who grilled those terrifyingly egg-headed University students and scruffy Poly herberts on University Challenge when I was a decidedly un-egg-headed schoolboy (am I the only one who thought the teams were actually stacked vertically?). As if the man’s calling weren’t strange enough, his exotic name inevitably spawned a million schoolboy slang terms, bad jokes and nicknames ? he’s one of the small group of media celebrities who’ve crossed over into the language and the collective memory. Anyway. Get this. He agrees with me about broadband. Open source lobbyists are pushing laws through various legislatures to prohibit Governments from purchasing software from companies who won’t publish source code. Bill Gates, naturally, sees this as a threat and will roll out his biggest guns to prevent it from happening. In this scenario, pointless and destructive conflict is inevitable. The zealots (and the monopolists) need to understand that monocultures are bad for almost everyone. The networked economy’s complex ecology needs diversity. Open source and proprietary code will co-exist and the tension created will be productive.